Senators’ upset bid ends in Game 7 loss to Rangers; the end for Alfredsson, too? By the time the puck dropped in Game 7, the Ottawa Senators' pockets were stuffed with house money. Picked by many (including us) to finish last in the Northeast Division and toward the bottom of the Eastern Conference, Ottawa entered Thursday night loose, knowing the pressure was on the top-seeded New York Rangers, who were facing elimination in their own building. But in the end, it was the Rangers' defense who got the better of the Senators offensively and in their own zone as New York advanced to the second round to face the Washington Capitals with a 2-1 victory. Goals from Marc Staal and Dan Girardi were the difference on the scoresheet, but it was Henrik Lundqvist (26 saves) who Ottawa was unable to solve all night. History was against the Senators coming into Thursday night. The Senators were 0-4 in Game 7s before this latest loss, while New York had never lost a Game 7 at MSG in three attempts. 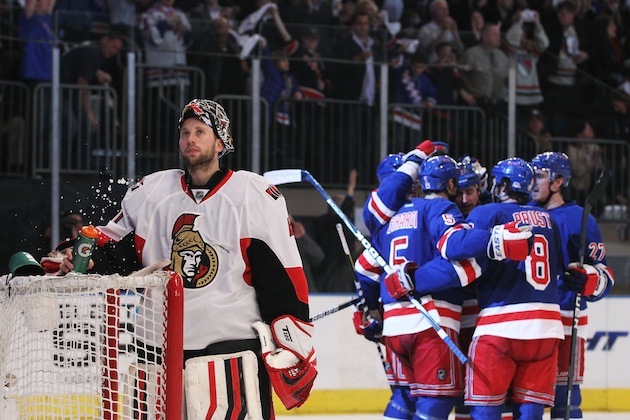 As they did all series long, the Senators made the Rangers earn this victory. They made Lundqvist be the hero and quieted New York's offensive stars, leaving two defenseman with only a pair of career postseason goals between them to do the scoring. Ottawa had their chances, including moments of 5-on-5 play that mirrored that of a power play as the Senators tied the Rangers down in their own zone and tired out their skaters, forcing Lundqvist to bail them out. Then there was Daniel Alfredsson, the Ottawa captain. His power play goal midway through the second period cut the deficit to 2-1 minutes after Girardi extended the Rangers' lead. It was another example of the 39-year old Swede leading by example. In possibly the final NHL game of his career, Alfredsson recorded six shots and scored his second goal of the series. Was the success of this season enough for Alfie to consider one more year? Said Coach Paul MacLean after Game 7: "I can't make decision for him, but we had a lot of fun this year and when you're having fun you should keep playing"
The Game 7 loss will sit sour in the mouths of the Senators until October, but rookie head coach Paul MacLean and his troops can take many positives out of this season. There were more than baby steps taken this year and Ottawa won't sneak up on anyone next year.